Bob Holman’s poetry has traversed genres, styles and media since the 1970’s, when he began directing Poets Theater productions by Mayakovsky, Artaud, O'Hara and others at St. Marks Church. 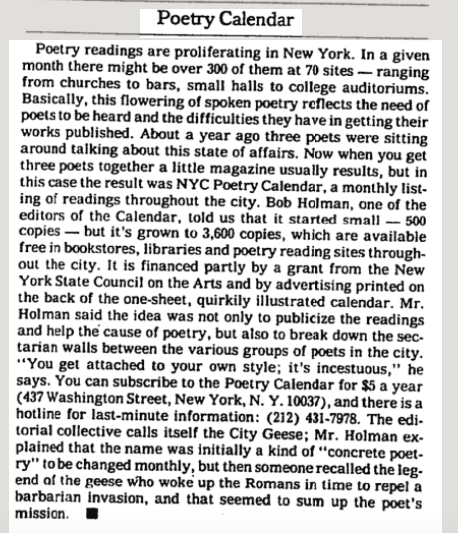 Richard Lingerman's coverage of the NYC Poetry Calendar from July 1978. "Someone recalled the legend of the geese Who woke up the Romans in time to repel a barbarian invasion, and that seemed to sum up [Bob's] mission." It was also at St. Mark's where Holman began his career as an arts administrator, serving at the Poetry Project as Coordinator, host, and workshop leader for six years, 1978-84. The first of Holman’s sixteen poetry collections, Tear To Open, was published by Power Mad Press in 1979. In 1985, Holman served as the host of “Lines,” a radio series for the Detroit Institute for the Arts. While serving as co-director of the Nuyorican Poets Cafe from 1988-96, Holman continued to explore the intersection of poetry and performance, originating and hosting the Cafe’s historic Poetry Slam series. Through Holman’s involvement at the Nuyorican, he became an instrumental figure in the popularization of performance poetry movements around the world. He won a Bessie (Off-Broadway) Award for Performance Excellence in 1992 for his work at the Nuyorican, and in 1993, the Cafe presented Holman with its Legends Award. In 1993, Holman became a professor of writing at The New School For Social Research, where he taught "Exploding Text: Poetry Performance" for three years. That year, and again in 2001, Holman was a New York Foundation for the Arts Poetry Fellow. In 1995 Holman pushed poetry further beyond the page when he founded the world’s first spoken word poetry record label, Mouth Almighty/Mercury Records, where he served as Vice President of Artistic Development until 1999. To ensure a permanent home for the arts in Lower Manhattan, in 1995 Holman founded Bowery Arts and Science, the non-profit arts organization where he served as Executive Director until 2005, and currently serves as Artistic Director. As creator and producer of the award winning, five-part PBS television series “The United States of Poetry,” Holman released his first long-form intersectional work in 1996. Featured at the Sundance and San Francisco Film Festivals, “USOP” won the 1996 International Public Television Award (INPUT). Holman’s poetry films have won awards at Berlin’s Zebra International Poetry Film Festival in 2002, 2004, and 2010. His experience melding poetry and media informed his professorship at Bard College, where from 1998 to 2002, he served as Visiting Professor of Writing and Integrated Arts. From 2007 to 2010, Holman was Visiting Professor at NYU’s Tisch School of the Arts, and he is currently on leave from the Columbia University School of the Arts. In 2001, Holman founded the Bowery Poetry Club, which continues to play host to much of the programming from Bowery Arts and Science. For his decades of work in service to the arts community in New York and beyond, Holman has received numerous community awards, including the Poets & Writers Barnes & Noble Writers for Writers Award in 2003, NYU’s Community Citizen of the Year award in 2005, the Elizabeth Kray Poetry award from Poets House in 2006, Zebra Film Festival’s “Founder of Poetry Video” award in 2010, the 2011 Hearing Our Voices Award from Voices Unbroken Incarcerated Youth Program, the 2011 Villager Award from Greenwich Village Historical Preservation Society, and the 2012 Urban Word Champion Award. Holman began his current work with the poetry of endangered languages while tracing the lineage of performance poetry to its root in orality and the world’s oral traditions—particularly those of West African griots—a quest captured in the 2010 LinkTV documentary film, “On the Road with Bob Holman.” While traveling from West Africa to Israel and the West Bank for “On the Road,” Holman became dedicated to protecting and preserving the world’s endangered languages. In 2010, he co-founded the Endangered Language Alliance, where he currently serves as co-director. West African oral traditions play an influential role in Holman’s recent poetic work. Holman explored the griot tradition of praise poetry in his artistic collaboration with photographer Chuck Close in their 2006 publication, A Couple Ways of Doing Something, where Holman’s praise poems serve as concrete analogues to Close’s daguerreotype portraits. Sing This One Back To Me, Holman’s 2013 collection from Coffee House Press, builds on Holman’s transcription of poems sung to him by his friend, mentor, and collaborator, Gambian griot Papa Susso. Holman’s forthcoming collection, Unspoken, to be published in 2018 by The Operating System, also contains a section of praise poems in the oral tradition. While the New York arts community, to which much of Holman’s career has been devoted, remains a primary focus of his, Holman has now shifted his lens to the global community of language. Language Matters with Bob Holman, a documentary exploring the endangered language crisis, aired nationally on PBS in January, 2015. Filmed around the world, “Language Matters” takes viewers to a remote island off the Australian coast, where four hundred Aboriginal people speak ten distinct indigenous languages, all at risk; to Wales, where Welsh, once endangered, has recovered; and to Hawaii, where Hawaiians are fighting to save their native tongue. In 2016, he was a selector for Poet's Corner at St John the Divine and for 2017, Bob is the creative consultant to Alonzo King's LINES ballet company, with a production inspired by endangered languages. He will also be teaching Exploding Text: Poetry Performance at Princeton University fall 17.